Uber is riding its self-driving cars into a legal showdown with California regulators. The ride-hailing company is refusing to obey demands by the state’s Department of Motor Vehicles that it immediately stop picking up San Francisco passengers in self-driving cars. 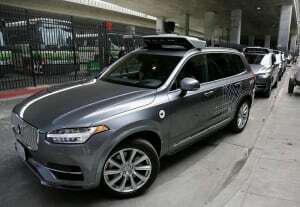 Hours after Uber launched a self-driving service Wednesday morning with a handful of Volvo luxury SUVs, the DMV sent the company a letter saying the move was illegal because the cars did not have a special permit the department requires for putting autonomous vehicles on public roads. “If Uber does not confirm immediately that it will stop its launch and seek a testing permit, DMV will initiate legal action,” DMV Chief Counsel Brian Soublet wrote the company. He referenced the possibility of taking Uber to court. Uber knew about the DMV’s permit requirement but argues that its cars do not meet the state’s definition of an “autonomous vehicle” because they need a person behind the wheel to monitor and intervene if needed. Parsing the definition of an autonomous vehicle is in line with Uber’s history of testing legal boundaries. During its meteoric rise into a multibillion dollar company, Uber has argued with authorities in California and around the world about issues including driver criminal background checks and whether those drivers should be treated as contractors ineligible for employee benefits. The two sides met Thursday, but a spokeswoman for California’s transportation regulators said that negotiations concluded without a clear resolution. Melissa Figueroa told The Associated Press that the two sides had a “positive conversation” that will resume Friday morning. Meanwhile, the cars could be seen traveling San Francisco’s streets Thursday evening. According to Anthony Levandowski, the leader of Uber’s self-driving program, Uber’s cars aren’t advanced enough to drive themselves without human monitoring. Therefore, he said, the Volvos are not autonomous — and do not require a permit. California has issued permits to 20 companies for tests of autonomous vehicles on public roads, mostly traditional automakers and tech companies. Getting a permit for prototype testing is part of legal language negotiated between the state and industry, and DMV lawyer Soublet argued in an interview that the permit process helps maintain public confidence that the technology is safe. “Don’t start doing this stuff. Apply for the permit. Follow the rules,” Soublet said of Uber. To receive a permit, a company must show proof of insurance, pay a $150 US fee and agree that a human driver can take control of the vehicle. Operating without a permit arguably gives Uber a competitive advantage. Companies with one must report to the state all crashes and every instance in which a person takes control during testing. All that information is public. Uber is sending another message to California: Other places want us if you don’t. The cars have an Uber employee behind the wheel to take over should the technology fail. Users of the app may be matched with a self-driving car but can opt out if they prefer a human driver. Self-driven rides cost the same as ordinary ones. Uber’s fleet of Volvo XC90s aren’t the first self-driving cars on San Francisco streets — several other companies visit regularly with test prototypes, though none offers public rides. Once testing is complete, the ultimate vision is to sell to the public technology that supporters argue will save thousands of lives because it doesn’t drink, text, fall asleep or take dangerous risks.